Some months after the end of The Blackhouse, Finn MacLeod is winding up his life in Edinburgh – his marriage, his job as a police detective – and returns to his emotional home, the island of Lewis in the Outer Hebrides. He plans to restore his parents’ derelict croft house while living in a tent – pretty brave, considering the Scottish island climate. Finn cannot make progress, though, because the old man has dementia and is degenerating rapidly. Finn’s gentle questioning of him throws up some clues, but not many. The author depicts Tormond very movingly, in particular his fractured internal life, in which past and present are confused. Something about Finn and Marsaili’s enquiries triggers the old man’s memories, and for much of the book we learn of his childhood. These sections of the book require the reader to suspend belief in the set-up in order to enjoy them, as they are written as if by an articulate, logical person and not convincing as a first-person narrative. On the other hand, the author needs to use this device to pace his narrative and to control when certain revelations occur. If one can overcome this flaw, the story is an emotionally gripping one, about “homers” and the cruel ways in which orphans were treated by the church, local councils and other authorities, in shockingly recent times. The narrative continues in a leisurely way, alternating between the old man’s memories and the present day, where Finn is searching for the identity of the dead man as well as re-establishing old relationships. About half way through the book there is a twist that puts it onto a different footing, and the mystery crystallises, gathering some much-needed pace in the process. The story is very well told, with a great sense of atmosphere and place. As with The Blackhouse, this novel really cries out for a map, as Finn travels up and down the islands on his quest amid storms and beautiful sunshine, beaches and wild cliffs. It would be very useful for the reader to be able to follow his journey across the various ferries and suspension bridges. The scenery is beautifully described, and the author cleverly includes elements of the traditional way of life, such as the Harris knitters, into his narrative. At the end, there is a double shock climax, which a reader could have guessed from the clues given, but may well not have done in either case. 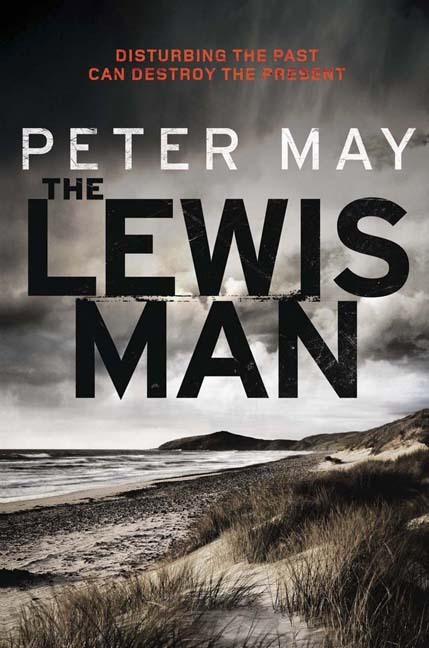 In sum, The Lewis Man is a readable mystery with a tragic core – all the more so because the events described really did happen to people. It rather strongly mirrors The Blackhouse, in that the former novel is about Finn’s quest to learn about his own past; and the new book is about Marsaili’s family’s past. The third novel, the to-be-published The Chess Men, will I predict focus on the next generation, as there are hints both that Finn will seriously try to track down the hit-and-run driver who killed his son, and that there will be continuing, perhaps escalating, family tensions between the MacLeods, MacDonalds and the Murrays on the Island of Lewis. Read other reviews of The Lewis Man at: Euro Crime (Amanda Gillies), Shots (Jim Kelly), and The Scotsman. About the book at the author’s website, including links to reviews, background information, videos and more. My review of The Blackhouse, the first in this trilogy. Great review. It tells me just enough about the plot without spoiling the sense of mystery that you get when you open a book you want to read. I hadn’t heard what the title of the third book would be – it will fit nicely in with the Lewis theme. I agree about the maps. 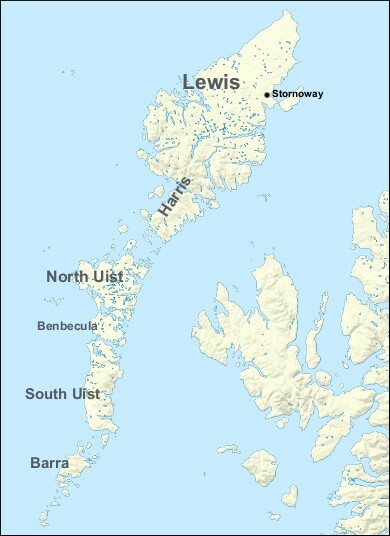 I read the first book without having a clue where the Isle of Lewis is situated. It must be doing wonders for the tourist industry though. I would love to visit the place now. Maxine – Excellent review as ever! I think books such as this one, where background is so important, can do very well by a leisurely pace at the beginning if it’s done well, and it sounds as though this one is. I’m especially intrigued by your description of Tormond. It takes a very deft hand to portray dementia well – I think Alice La Plante succeeded, for instance – and it’s interesting that Tormond’s memories are key to discovering the truth about the victim. I’m really interested in this one! Thanks, Sarah and Margot. I’m definitely glad I discovered this series, but as usual with series, it seems like a long wait until the next installment! Thanks for the review. I heard about this book on Elaine Charles’ radio show, The Book Report (http://www.bookreportradio.com), where they played an extract from the audio book. It sounds like excellent stuff. As always, so many books, so little time.